On Tuesday, the government of Uganda said it was willing to consider giving asylum to the deposed Sudanese leader in appreciation for his role in the South Sudan peace deal. Mr Oryem also said that the government of Uganda is “closely watching” developments in Khartoum and that Uganda prays the players in the transition respect the will of the people. Bashir was overthrown by the army last Thursday following several months of protests occasioned by deplorable economic conditions, bring an end to his 30- year reign. Uganda has come to the rescue of disposed Sudan’s longtime president Gen Omar al-Bashir. 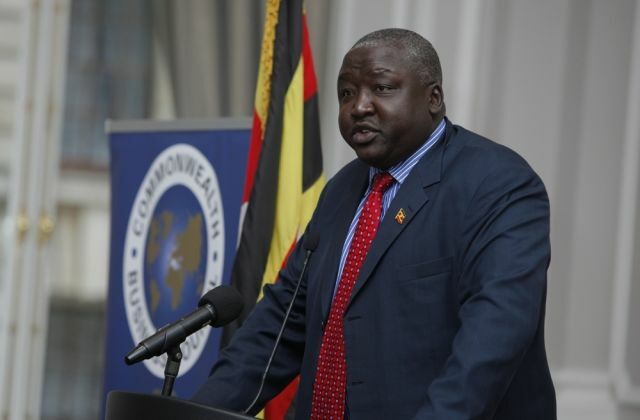 “If Omar al-Bashir applies for asylum in Uganda that is a matter that can be considered by the President of Uganda.” Uganda’s State Minister for foreign affairs Henry Okello Oryem told journalists at Parliament buildings. Mr Oryem went ahead and described al-Bashir as president even after he was deposed by the Sudanese army last week. “President Omar Bashir was co-guarantor for the peace agreement of South Sudan, he has played a very critical role (for)which we are very grateful and his asylum in Uganda is something we can consider,” the minister added. 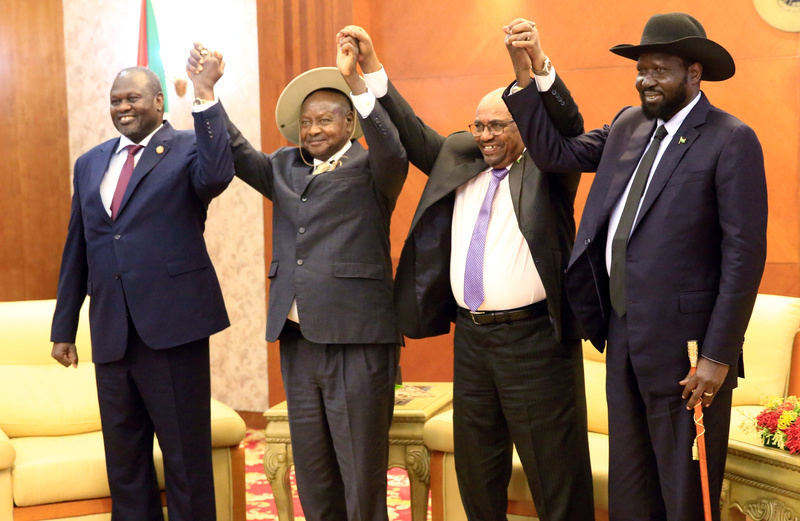 Sudan’s President Omar Al-Bashir hold hands with Uganda’s President Yoweri Museveni, South Sudan’s President Salva Kiir and South Sudan rebel leader Riek Machar during a South Sudan peace meeting in Khartoum. Mr Oryem was speaking to journalists after appearing before the Foreign Affairs committee to present the ministry budget proposals for the Financial Year 2019/20. He is also accused of failing the fight against corruption and ruling the Sudanese people with an iron fist. Meanwhile, Bashir was reportedly moved to Kobar prison in the capital Khartoum late on Tuesday, according to two family members who spoke to the media. A source at the prison said Mr Bashir is being held under tight security in solitary confinement. Ironically, most of the political prisoners imprisoned during his reign are locked up in the same prison.